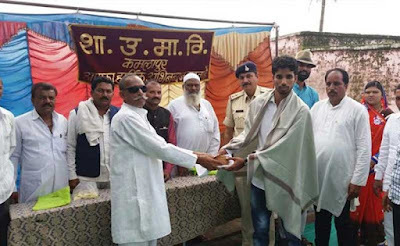 Police in Madhya Pradesh, India, arrested Ansar Khan, 20, on Friday for wrongly claiming that he was employed with United States' space agency, National Aeronautics and Space Administration or NASA. A fake identity card, with US president Barack Obama's forged signatures, was also recovered from him. 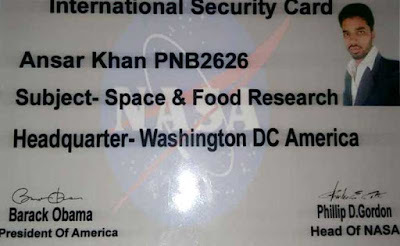 Mr Khan, who has only studied up to class 12, claimed he was appointed to the space agency's 'Space and Food' program with an annual salary of Rs. 1.85 crore (£210,000, $270,000) and was set to start work later this month. He even invited the senior officials of Kamalpur administration for a felicitation programme in his honour. However, this proved to be his undoing. Senior police officer Shashikant Shukla became suspicious of Mr Khan when the latter came to invite him with his 'identity card' around his neck. Noticing president Barack Obama's signature on the card, Mr Shukla ordered his office to verify the young man's claims. During the investigation, not only was Mr Khan's fraud exposed, police also discovered that he had borrowed money from several people promising to pay back when he received his salary from NASA. 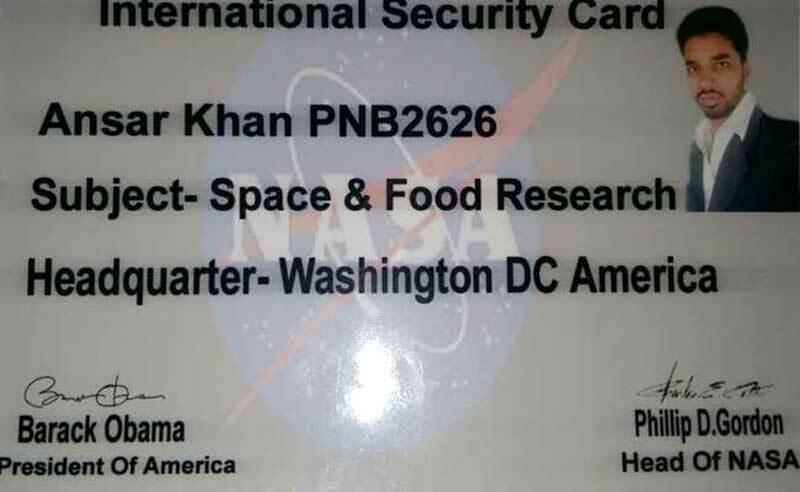 According to the police, he had visited a local photo studio on August 14 where he had a fake NASA identity card printed complete with the space agency's logo and the signature of Barack Obama. Believing Mr Khan's claims, his school and several local organisations organised functions to celebrate his achievements. At one time he was even honoured in an event which had the local legislator in attendance. "Our SP got suspicious after seeing his (Ansar's) identity card and we started our investigation. The owner of the photo studio told us that Ansar kept on postponing his date of going to the US and did not even possess a passport. He had even taken money from people for going abroad," police officer BS Gaure said.